Louise King conducts a variety of workshops throughout the year. Regional and school workshops can be organised and Louise will travel to your community or school. Are you a school music teacher looking for someone inspirational and dynamic to work with your students and ensembles? Do you want to boost the creativity and enjoyment of music making in your community? Louise is a highly experienced educator and conductor who leads students and musicians through a range of practical performance and composition projects. Can’t find what you are looking for? Louise can work with you to develop a workshop at your school or community that will enhance your music program and unlock musical potential. Workshops are based around concepts such as listening, leading, breathing, blending and style. Each workshop can culminate in an informal performance for family and friends. The workshops are designed to unify and bring together musicians in an inspiring, motivating performance experience. The following workshops are available to be booked. Contact Louise King to find out more information and for costs of workshops described. ABOUT A masterclass is a unique opportunity to get up close with a ‘Cello Master’ (someone who has spent a long time and thousands of hours learning and teaching it!). A masterclass can be presented at various venues throughout Australia – schools, community venues, and private teaching studios for example. It offers the opportunity for a limited number of students to participate on stage in a performance focused learning experience. It is possible to attend a masterclass as an audience member, which is still a valuable learning asset to further your cello awareness and skills. ABOUT Do you hate playing scales? Do you wonder why teachers make you play them? Get to technical grips with the AMEB Technical Workbook in this fun, interactive and inspiring workshop. Improve your intonation by learning about listening and left hand flexibility. Have fun creating short easy improvisations in the scale patterns you are learning. Increase your music theory knowledge by understanding how your scale and arpeggio patterns are put together. Perform and polish your technical exercises in an open and engaging learning environment. 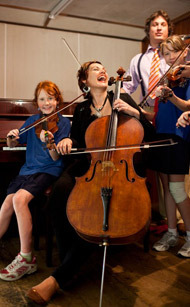 Louise King will lead student cellists through an intensive and fun educational experience. Discover that you too can enjoy playing scales! Observers and teachers are welcome to attend. ABOUT Adult Cellists can come to a workshop to have the opportunity to play music with others, develop playing under guidance and enjoy sharing their love of music and the cello. The workshop is designed to bring together adult cellists in an inspiring, mentoring and fun informal chamber music performance experience. The music is arranged in several ability levels from grades 3-8 and is carefully selected to create a musical challenge for every player. You will play great well-known classical music, modern songs and folk music and have a go at group improvisation. Sessions will encompass a wide level of musical tasks in a mixed level class. A short social refreshment break allows members to meet new people with a similar passion for music and the cello. Do you play the cello? Do you play in school string ensemble and feel the violins always get the tune? Come to a workshop! An opportunity for aspiring cellists young and old to meet for an intensive, fun-filled afternoon of melody, harmony, group tuition, technical warm-ups, improvisation, musical guidance and inspirational tips from one of Australia’s top professional cellists and teachers. Workshops will encompass a wide level of tasks in a mixed level and age group working on ensemble skills, musicianship and performance tips. Attending a workshop can unlock your creative juices, hone your technique and develop your musicianship. Come and enjoy playing music for Cello Ensemble! Celtic Grooves, classical greats and fun dance music such as Tangos, Sambas, Bourrées, Courantes, Pavanes, Jigs and Minuets – all arranged for several ability levels. Learn side-by-side with fellow cellists and play along with a professional musician. Participants come and develop their playing and individual performance style. Workshops are designed to bring together players in an inspiring, mentoring and informal performance experience. Be inspired to take great musical leaps in a short time in a concentrated and engaging learning environment. Workshops are ideal for all aspiring musicians. All cello players are welcome. English cellist, Louise King moved to Australia in 2003 after working extensively in professional orchestras in the UK, Hong Kong, Cairo and Europe. An award winning graduate of the Royal Colleges of Music in London and Manchester, Louise studied with Emma Ferrand, Leonid Gorokhov and William Bruce and the baroque cello with Richard Boothby. Louise is in great demand as a soloist, chamber musician, master class presenter, adjudicator and orchestral tutor and performs at Australia’s finest music festivals and with Sydney’s orchestra seventeen88, the Australian Chamber Orchestra, Topology, The Queensland Orchestra, Southern Cross Soloists, Endeavour Trio, Tulipwood Quartet and as a tutor for the Australian and Queensland Youth Orchestras. Her performing life embraces solo recitals, recording, producing the chamber music concert series dreaming BIG, new Australian works and working with artists such as Katie Noonan, Il Divo, Boccelli, and Josh Groban. She also enjoys world music and dance collaborations, improvisation and working with singer-songwriters, coaching ensembles and community music workshops. She is a dedicated and inspiring teacher and particularly enjoys working with aspiring young musicians and adult students. Which Workshop Types are you interesting in? YOUTH WORKSHOP 1 - Ready Set Go! Please select which workshop type you are interested in (more than one selection is ok.
Do you have any specific information you would like to add to your booking of Workshop Type? Louise King presents workshops throughout the year. Are you a cellist or a music teacher looking for someone inspirational and dynamic to work with you or your students? Louise is a highly experienced educator and conductor who leads students and musicians through a range of practical performance workshops. Each workshop culminates in an informal performance. The workshops are designed to unify and bring together musicians in an inspiring, motivating performance experience. Come and enjoy playing music for Cello Ensemble. Play Celtic Grooves, classical greats and dance music such as Tangos, Sambas, Bourrées, Jigs and Minuets – all arranged for several ability levels. Under the guidance of professional musician and educator Louise King, the participants will perform in a community CAROLS ORCHESTRA. This workshop is designed to provide a performance extension opportunity to motivated musicians in the community. Cello Dreaming recommends that participants have completed a minimum of Grade 1 AMEB / Suzuki book 1 to be attending the Workshop. Please complete an online booking for each applicant by Wednesday 7 December. BYO instrument and music stand. The booked place cannot be exchanged with another applicant, returned and refunded after purchase. The right is reserved to add, withdraw or substitute presenters, artists, vary ticket prices, and/or vary advertised programs, seating arrangements and audience capacity. The presenter, performer and Cello Dreaming reserve the right of admission to the workshop. If the workshop has to be cancelled due to natural disaster, adverse weather conditions or for any other cause reasonably beyond the presenter’s control, there is no right of refund or exchange, and no obligation is assumed by the presenter for the arranging of a substitute event.